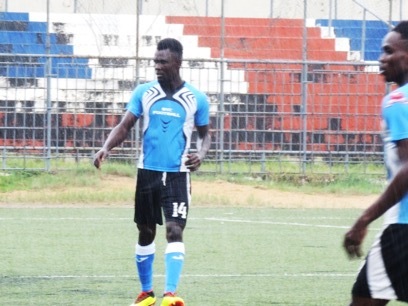 Monrovia – Trokon Myers scored four goals as Barrack Young Controller bounced back from a 1-0 defeat at home to Monrovia Club Breweries to dump Small Town FC 1-5. Myers, who took control of the LFA scoring chart, was on target four times in the space of 26 minutes as BYC took control of their first away match of the new season. Kelvin Potis stunning finish 15th minute after rounding goalkeeper Mohammed Keizo was canceled out from Amalu Dorley’s tap-in for Small Town in the 38th minute. But Myers’ cool finish excellently restored the Go Blue Boys lead in the 53RD minute. Myers extended the Go Blue Boys advantage inside 68TH minute before grabbing his hat-trick five minutes later and then follow a coolly converted penalty ten minutes from time to grab his fourth of the afternoon. Small Town is yet to register a win in the league and started the match on the front foot after George Mawolo missed from 6-yard out with a free header from a Lawrence Paigar corner in the 8th minute. Two minutes later, Junior Bing missed another free header after the ball beat BYC’s debutant goalkeeper Myers Diggs, but the defender effort went wide. The Go Blue Boys got themselves in it and John Jaysay was the architect of the opening goal in the 15th minute after a delicious pass found Potis, who rounded the onrushing goalkeeper Keizo before blasting the ball into the back of the empty net. Small Town equalized in the 38ththrough Dorley after Abubakar Kamara’s pass found Lawrence Paigar who beat goalkeeper Diggs to unselfishly connect Dorley who smashed his effort for the equalizer. After the recess, Myers re-established BYC lead in the 53-minute after Potis put the forward through and he beat the goalkeeper Keizo with a cool finish. Two Minute later, Potis exchanged passes with Samir Kamara before the defender played the forward who an ambitious effort wide over the crossbar. As the Go Blue Boys dominant procedure, Myers double the lead with his second as he utilized substitute William Freeman smart pass to tap in from close range in the 68th minute. The result means BYC are second in Group A after three games with six points with Monrovia Club Breweries forcing Jubilee to a 1-1 draw. The Beer Boys have to wait until the 95th minute to equalize through Mitis Mulbah penalty and it was his fourth goal of the season.